Make Your Own Boat Party A Reality! Dine, dance and enjoy the whole yacht: deck and walkways provide an unobstructed view of the water from all sides. Miss Toronto can also be fully enclosed in case of rain. 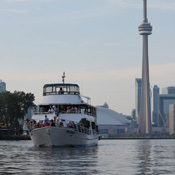 From the time we pull away from the dock until your party boat touches back 4-5 hours later, you and your guests will have enjoyed a scrumptious meal, refreshing drinks and a relaxing cruise throughout Toronto Harbour, Toronto Islands and along the city's beautiful waterfront. Our DJ will keep your toes tapping as he plays the latest hits or tunes from the past. Like the rest of our crew he will attempt to satisfy all of your requests. 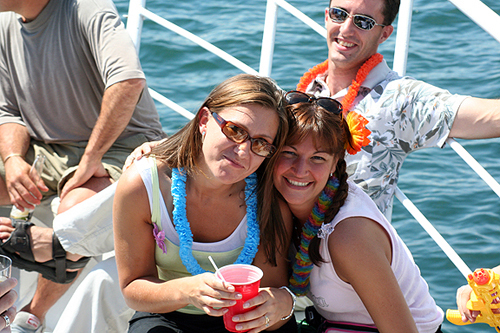 As operators we pride ourselves in providing six star service on every party cruise. Let us wine, dine and entertain you and your friends on a party cruise that will be talked about long after you have disembarked. Corey Dawkins has been a main fixture in Toronto's music scene since 1998 as both a DJ and promoter. His versatility, passion and knowledge of music has allowed him to become one of Toronto's finest. Corey has teamed up and been showcased with the best talent in the city and he is repeatedly referred to by his followers, and fellow DJ's, as one of Toronto's best and most underrated - although that is beginning to change! Corey's musical mantra is "A DJ is like a preacher speaking to a multitude of people, I speak with base lines, vocals and chords". From 2006 to 2012, Corey was heard on the Vibe Collective every Saturday afternoon on CIUT 89.5 fm. Be sure to find his monthly online mixes on Soundcloud and Mixcloud. 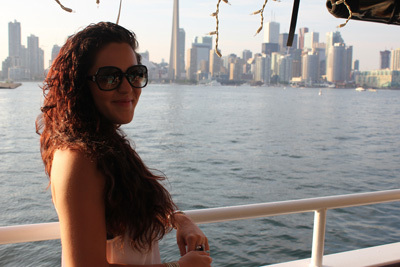 Make your own social boat party a reality on Miss Toronto today.